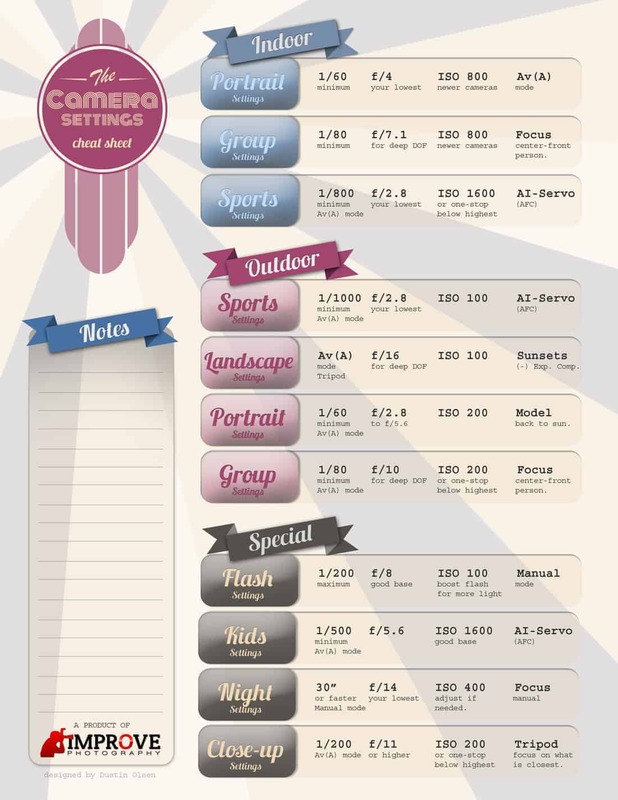 Download this camera settings Cheat sheet from Improve Photography. Photographers set their exposure using a combination of shutter speeds and f/stops to get the correct amount of light on the sensor of the digital camera. The shutter speed regulates how long the sensor is exposed to light coming through the lens. The f/stop regulates how much light is allowed through the lens by varying the area of the hole the light comes through. For any given ISO and lighting combination there is one correct amount of light to properly expose the image. This amount of light can be achieved with many different combinations of f/stops and shutter speeds. A good analogy for exposure is filling a bucket with water. A bucket is of fixed size and needs a certain amount of water to fill it, just like the sensor in your camera, which is of a set sensitivity (the ISO) and needs a certain amount of light to optimally capture an image. To fill a bucket, you can pour a small stream of water for a long time or a fast stream of water for a short time. Either way, you end up with the same amount of water. In photography, the size of the stream of the water is analogous to the f/stop, the length of time you pour is analogous to the shutter speed, and the size of the bucket is analogous to the ISO. Broadly speaking, from the bucket's point of view, it doesn't matter which combination of stream size and length of time you choose as long as the right amount of water ends up coming in. Photography is the same; within limits, your camera is indifferent as to the combination of time and amount of light as long as the right amount of light eventually arrives. Each of these settings is clearly half/double the length of time of its immediate neighbours (OK, 1/15th isn't exactly half the time of 1/8th and 1/125th isn't exactly half the time of 1/60th, but it's close). f/stops are a bit more confusing because the numbers appear so arbitrary. This is the standard sequence of f/stops from f/1.4 to f/22. Although it may not seem intuitive at first, in this sequence the f/1.4 setting lets in the most light while the f/22 setting lets in the least. Also, each of these f/stops has precisely the same halving/doubling relationship as the shutter speed sequence. On the face of it, going from f/4 to f/5.6 doesn't sound like halving the amount of light. What's more, 5.6 is a larger number and sounds like it ought to be more light, not less. Neither does f/4 to f/2.8 sound like doubling the amount of light. In fact, each of the numbers in this sequence is a halving/doubling of the amount of light from its immediate neighbours, just like the shutter speed settings are. Not only that, but it makes sense, as I shall show below. The reason that both the halving and doubling and the smaller numbers mean more light things make sense is that the f/stop is a ratio. The ratio is between the diameter of the aperture in the lens and the focal length of the lens. So, does that mean f/8 is the same brightness of illumination on the sensor regardless of focal length of the lens? Yes. That's why they're so handy! It's also why handheld light meters work--they have no idea what sensor size or camera body or lens you're using, but they can tell you that 1/125th at f/8 is the correct exposure (or at least one of a whole host of equivalent exposures, we'll get to that later). It doesn't matter if you set that f/8 on a 20mm or a 400mm, or if the camera is from 1954 or from last July. When people talk about a fast lens, what does that mean? Lenses are referred to by their maximum aperture (that's the biggest hole, the smaller number). Thus, Nikon made (at least) four 28mm lenses at one point, a 28 f/1.4, a 28 f/2.0, a 28 f/2.8 and a 28 f/3.5. All four of these lenses had f/4, f/5.6, and so on up to f/16; they were distinguished by the maximum amount of light they could let in. The 28mm f/3.5 when set to its maximum aperture of f/3.5, lets in one third less light that the 28 f/2.8. The 28 f/2.8, in turn, at its maximum aperture, lets in only half the light of the 28 f/2.0 at its maximum aperture. The 28 f/2.0 lets in only half the light of the 28 f/1.4 at its maximum aperture. Lenses which have wide maximum apertures and let in lots of light are called fast lenses. Lenses which let in comparatively less light at their maximum apertures are called slow lenses. The 28 f/1.4 is a very fast 28mm; 28 f/2.0 would be a fast lens; the 28 f/2.8 would be sort of regular, for which there isn't really a name; the 28 f/3.5 would be kind of slow. Why wouldn't you always use a fast lens? Weight and expense. To get those larger diameter apertures means you need larger pieces of glass mounted in correspondingly larger lens barrels. They're harder to manufacture, the lens barrel keeps getting heavier to hold all that glass in alignment so it all gets weighty in a hurry, they're harder to autofocus and they're more challenging optical designs. Also, there have been very fast lenses made which have the reputation of being really nice wide open but kind of dodgy stopped down. If you normally do not use the fast lens at its widest settings, if you are mostly at, say, f/8, then you are carrying around a heavy and expensive optic which may be under-performing its cheaper brethren stopped down. My Zoom lens says it's f/4.5 to 5.6. What's that mean? This relates to the size versus lens speed issue. Take the Nikon 24-85 f/2.8-4 zoom lens, as an example. It's not exactly small and light, but it tries. If you think about it, the size of the elements needed to get f/2.8 at 24mm is much smaller than the size needed to get f/2.8 at 85mm. To keep lens sizes and costs down, the lens manufacturer accepts that the lens will be faster at the wide end of its focal length range and slower at the long end. As a result, you can open up to f/2.8 at the 24mm end of the range, but only to f/4 at the 85mm end. This is particularly noticeable in small lenses that do, say, 70-300mm where at the 300mm end the maximum f/stop is f/5.6 or worse. It also shows up in some compact point and shoot superzooms, which can have unspeakably slow long focal lengths. I hear stops referred to a lot. Are these always f/stops? No. A source of confusion is that "stops", as in f/stops, has become a handy shorthand for other doubling/halving relationships when referring to exposure. Thus, when someone says they "stopped down", they probably did change the aperture from, say, f/8 to f/11. However, if someone says they wish they had a stop more light, they mean they wish they had twice as much. When you stop down a lens, you are going to a larger number/smaller aperture and therefore less light. Going from f/8 to f/11 is stopping down. The opposite is opening up; going from f/11 to f/8 is moving towards the smaller number/larger aperture and therefore more light. What About my weird f/stops? The f/stop sequence listed is the full stops. Most things in photography work in 1/3 or 1/2 stop increments, and you will find lenses with maximum apertures at other-than-full f/stops. I You see these much more in modern digital cameras which tend to show half or third-stop increments in their LCD displays, fine gradations you never saw on physical f/stop rings. You Say Most things Double and Halve? Each step here is a doubling/halving of the sensor's sensitivity to light. Thus, ISO 100 requires twice as much light to be correctly exposed as an ISO 200 but only half as much as ISO 50. You would say it was a stop slower than the 200, a stop faster than the 50. In film days, the ISO was for the whole roll of film; now on digital cameras one can change the ISO from shot to shot, and as you change this you'll see the half or third-stop increments go by as you choose. There are third-stop intervals in ISOs as well. Here are the third stop increments of ISO with the full-stops in bold. So What's Important in all this? You need to know the doubling/halving relationship and how it works with shutter speeds in exposure. You need to understand that for a given amount of light and ISO, there are many combinations of shutter speeds and f/stops that give the same amount of light on the sensor (see next paragraph). You should understand that, with digital cameras, if you find yourself in a bad spot in terms of shutter speed and f/stop, you may be able to mitigate matters by changing your ISO. This is key since the shutter speeds and f/stops you choose have implications in how your final photograph will look in ways other than purely the amount of light on the sensor. You need to know that as you stop down you get more depth of field. Practically speaking, you aren't going to have one lens which takes you from f/1.4 to f/45 and your camera body may not have the higher shutter speeds. Also, if you are without a tripod, there are limits to how slow your shutter speed can be before your body movements blur the photo, so there are some constraints. But the point remains, all these combinations yield the same amount of light on the sensor and an identical picture in terms of brightness. What does vary is the ability of the camera to stop action and the depth of field, or how much is in focus in front of and behind the subject . This gives you some control over how your photographs will turn out. You should understand it and use it.